Celebrate one of Washington DC’s most popular springtime traditions: The blooming of thousands of cherry trees along the tidal basin! Avoid the hassle of fighting traffic and trying to find parking by taking our afternoon excursions, which offer three pickup stops in Northern Virginia. You’ll have enough time explore and to enjoy the floral display along tidal basin as well as the nearby monuments — pack a camera and a picnic lunch, or purchase an optional Bento Box lunch from Benihana. Remember to dress for the weather and wear comfortable walking shoes! OPTIONAL: Catered Bento Box lunches are available to purchase for $15. Your Bento Box will contain your choice of chicken, beef or salmon served with soup, salad, edamame, tuna sashimi, half of a California roll, shrimp and vegetable tempura, steamed rice and fresh fruit. 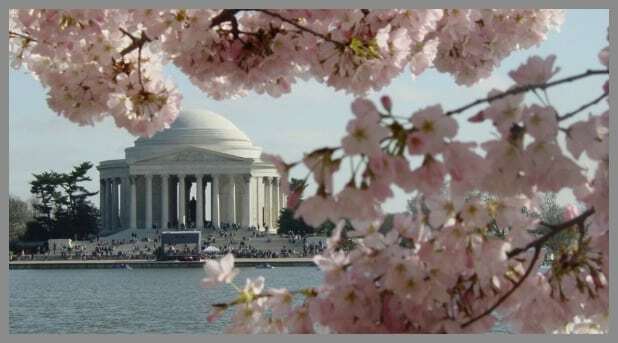 For tips on great spots to photograph the cherry blossoms, click here to visit Destination DC’s website! *Please note times are approximate and may vary slightly due to traffic, weather or other factors. Please make sure to arrive at least 15 minutes before noted departure time to allow time for boarding the vehicle. Passenger minimum of 10 must be met for trip to run. Bookings close at 3:00pm on March 26th.